I was trying to unlock a business briefcase leftover from the days when I needed such things. The combination number was 976. It was all a bit sticky as I hadn't looked inside for probably a few years but I managed to get it open - and that was that. The same night I switched on the television and there was an old movie called 976 - Evil being shown. I didn't watch it as there was football (soccer) on another channel, much more to my taste. But the number stuck in my head so today I followed my feeling and Googled 976. Somehow I got to a website about the moon, because the website name ended in /976. It was all about how the moon might in fact be hollow and could even be artificial - not a real planet in other words. The website Pure Insight wrote, "The sun is 395 times larger than the moon, yet it is 395 times farther away from the earth than the moon. The two appear the same size when seen from earth because of the distance differences. Is this a natural or artificial phenomenon? Where in the universe can one find three celestial bodies with this kind of coincidence?" It then went on to talk about how we only see one side of the moon, how meteorite craters are all too shallow, UFOs that have been seen there and how the moon is actually a hollow spaceship. Lots for many to laugh about there but, well, who knows for sure. 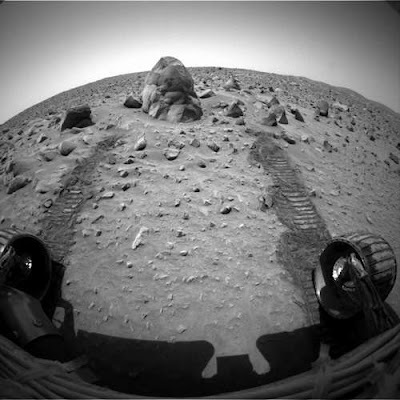 Somehow this then got me to the NASA website and a photo of Mars as seen below from the Mars Exploration Rover Mission. It's genuine and untouched and you can see the original yourself here. What interested me was the mound of rocks towards the top of the photo as there seemed to be marks on this, plus to me it appeared a strange shape to be natural. I cropped the photo added a slight touch of sepia for colour and the result is at the head of this post. Note the three black marks, some sort of symbol? And to the right of the mound running downwards seems to be another row of markings - writing or symbols? Okay, might just be my imagination but if some people think the moon is artificial and there are UFOs coming and going at the 'other side' who knows. After all, isn't it odd that there have been no recent visits by man to the moon? I think that man did go to the moon but perhaps he found something he didn't quite like - so 'those' photos at the time were done in a studio - thus the debate over the discrepancies, and the whole conspiracy theory about how man never actually went to the moon. It's strange how the number 976 started me on a whole new track - mmmm, interesting! Intriguing! I've often wondered, too, why we haven't returned to the moon. It would seem to be the natural thing to do now rather than reaching for, say, Mars. Off to see the original photo! This is fascinating stuff. Makes me wonder just "when" we here on Earth will be actually meeting intergalatic travellers en masse. 4 is the number of Mother Earth and our foundations, our home. Mother Earth is a volatile entity constantly creating. Yet our foundations and home are considered our stability. But the breakdown of numbers of your 4 energy is different with 976 than with 2011. 9 represents endings and transformation as the phoenix rising from the ashes. 7 represents spirituality and our personal belief system on every level from rituals in religion and the occult to cultural traditions. 6 represents love which includes nurturing and compassion as well as the powerful conflicts that entice us to transform into a phoenix capable of rising from the ashes. How fun that your 976 (= 4) journey took you to the moon and then to Mars and cool rocks. When the news that we are not alone in the universe is announced from the governing entities on spaceship earth, I hope lots of people find your blog instead of getting sucked into a fear zone. Good stuff, Mike. I have sort of wondered why we haven't been back to the moon and the space race stopped. Every other race is an annual event. Sorry to be that guy, but while those marks on the rock aren't natural, they also aren't of a mysterious origin. 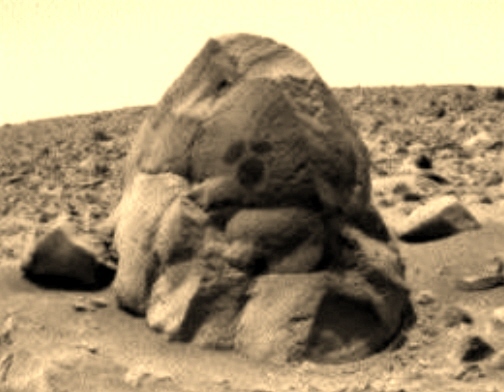 The marks were made by the rover drilling into the boulder to take rock samples.